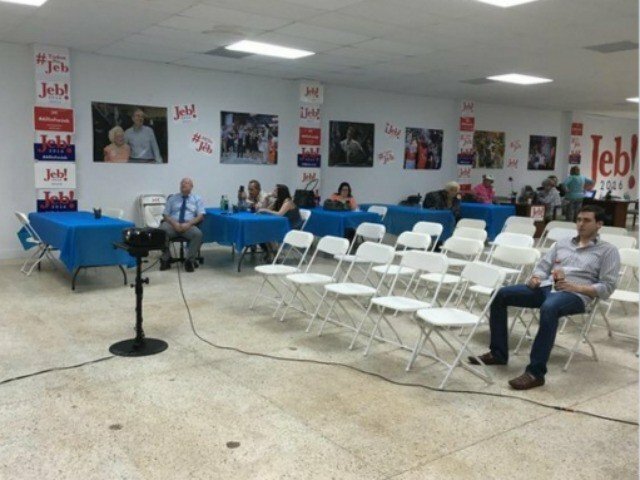 The Washington Post sent out a pic of a Jeb Bush party in Miami, Florida. That’s Jeb Bush’s home state. It is one of the saddest, most pathetic pics I think I have ever seen. In it, there is one supporter sitting off by himself. I believe the blue tables are campaign staff, but I’m not sure on that one. One of the latest polls out there has Bush at 5%. I’ve seen others where he is at 3%. Compare that to Trump who is somewhere between 36 and 41%. It’s staggering. Jeb Bush really should drop out of this race, save face and money. His heart’s not in it and this is just getting embarrassing. 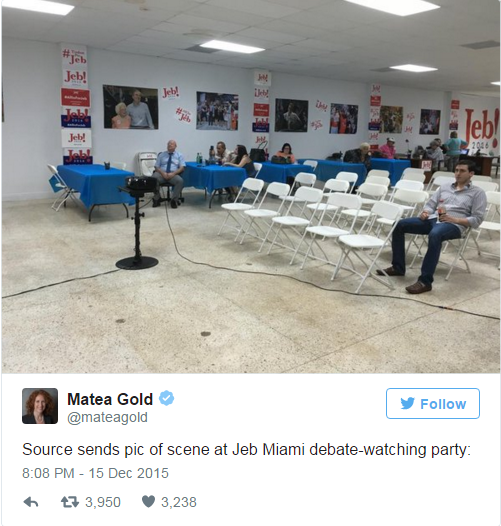 A photo has emerged online of a lone Jeb Bush supporter at a Bush party in Miami, Florida. Matea Gold of the Washington Post tweeted the photo during the fifth Republican presidential debate. How can Bush even think he has a prayer? Rush Limbaugh quoted a leak from Bush’s camp that they felt their strategy should be to take out every other Republican but Trump. That Americans would be so turned off by Trump that they would nominate Jeb. That is one of the most patently absurd things I have ever heard. Talk about a disconnect. These people don’t know what reality is and they sure as hell don’t know what conservative voters want. Bush has stuck to his Amnesty, Common Core guns all the way. The best he can do is call Trump names. Bush should go back to being a governor or working the family business. Let those with a fire in their belly take the lead. We need a fighter to battle terrorists and America wants a conservative… not an establishment guy who is tone deaf. This picture is cringe worthy.